Whiskey History: What Is Straight Bourbon? Angel’s Envy® is a Kentucky Straight Bourbon that’s finished in port wine barrels, and while we spend a lot of time talking about the “aged in port wine barrels” part (which we’re proud of), we tend to gloss right over “Kentucky Straight.” So what exactly is a straight bourbon (and no, we’re not talking about enjoying a glass neat)? Straight whiskey was and is largely a matter of aging and proof assurance. The Pure Food and Drug Act does stipulate that whiskey must be created by distilling a fermented cereal grain mash, but beyond that, it’s all age and proof. Once distilled, the whiskey may not exceed 80% ABV, and it must be aged for a minimum of two years, otherwise it can’t qualify as “straight.” At the point of barreling, it must be 62.5% ABV or lower, and only water may be added to dilute it at this point. Ideally, the whiskey should be aged for four years or more, as any spirit aged between two to four years must display an age statement on the bottle indicating the age of the youngest spirit in the bottle. In fact, all straight age statements reflect the youngest spirit in the bottle. 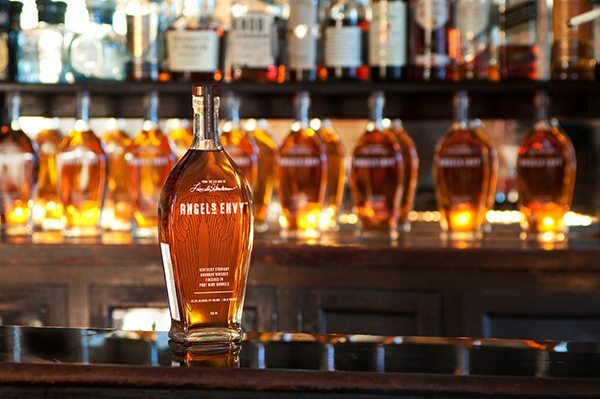 While old standards like bottled-in-bond are gradually fading into the past, the Kentucky straight tradition is still alive and well with Angel’s Envy. Veach, Michael R. Kentucky Bourbon Whiskey: An American Heritage. N.p. : n.p., n.d. Print.